Today, our theme is vesicles. 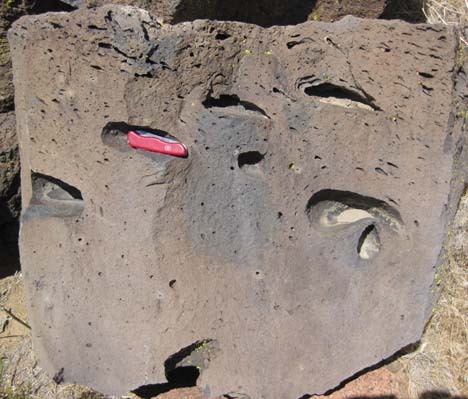 Here are some images of vesicles in basaltic lava flows in the Owens Valley of California, the same spot where we saw the baked fanglomerate that I showcased a few days back. Also visible are several cooling joints that intersect to form columns. At the lower part of these columns, you can see arrest lines perpendicular to the column. Each of these subhorizontal lines represents a single instance of fracture propagation as the column separated from the rest of the flow. In composite, they form a “crack panel” like others showcased here in the past. They aren’t as big as some I’ve shown here in the past, but they were the largest vesicles I saw on the Owens Valley Field Forum last September. One thing I find interesting about this batch of vesicles is how they deform one another. The big one in the upper right has several smaller ones above it that “wrap around” its left edge. I envision this as the small bubbles hanging out with ~neutral buoyancy (ascendancy power), when up from below comes this massive bubble. As it pushes up (with its greater buoyancy), they smear out to the side, out of the way. Likewise with the pair of large vesicles at lower right: it looks like the big flat one was there first, with the smaller “egg-shaped” one rising up from below and impinging on its larger upstairs neighbor. If the lava has been less viscous, the two may have merged into one, as blobs in lava lamps may be seen to do: a minimizing of surface tension, a lowering of the surface-area-to-volume ratio. Why would the smaller impinge on the larger? As I’m envisioning it, there would be a viscosity gradient in the cooling flow, with cooler temperatures towards the top (and hence higher resistance to flow). Deeper in the lava, temperatures would remain warmer, and hence the lava would be less viscous. 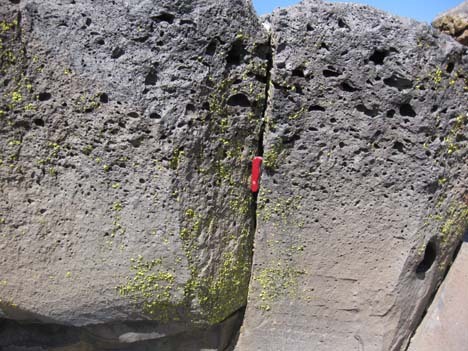 I’m thinking that the big flat bubble had essentially risen as far as it could, but its top side was cooler than its more ductile bottom side, and so the bottom side was less resistant to the nosy intrusions of upstart bubbles from below. Do you see anything else worth discussing in these photos?